Groundwater basins are important sources of water supply and storage for many cities. Groundwater exchange pools offer additional opportunities for utilizing these common pool resources, but their potential role in urban water management is not clear, and modeling such exchanges can be challenging. 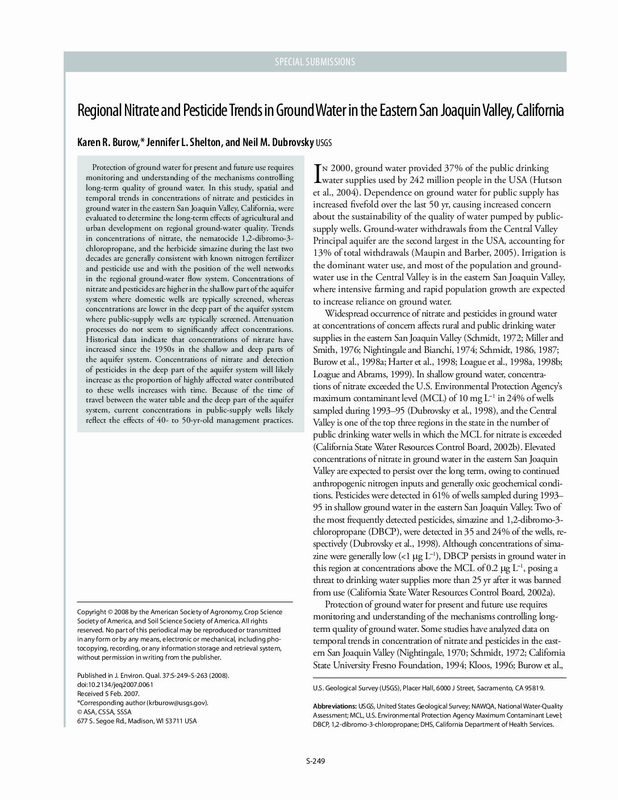 This paper presents an analysis of the potential for groundwater basin exchange pools to contribute to urban water supply sustainability. 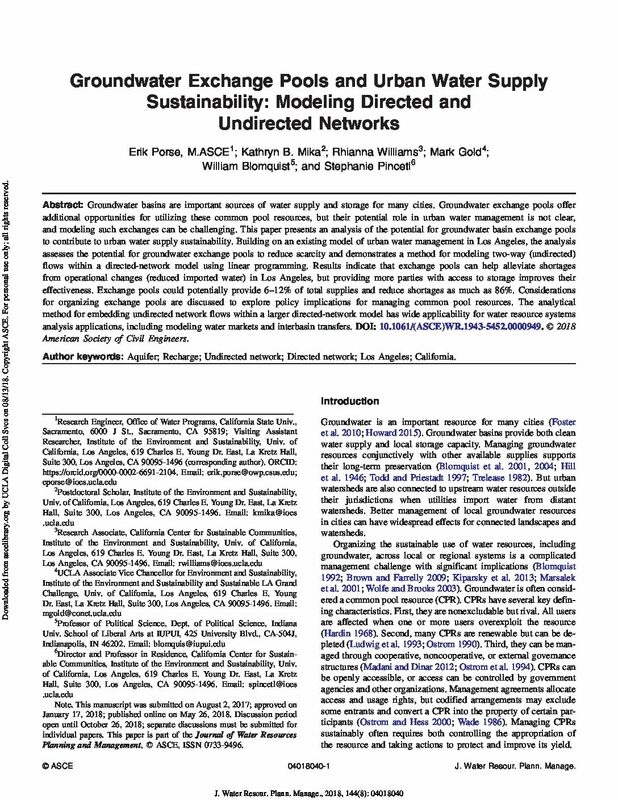 Building on an existing model of urban water management in Los Angeles, the analysis assesses the potential for groundwater exchange pools to reduce scarcity and demonstrates a method for modeling two-way (undirected) flows within a directed-network model using linear programming. Results indicate that exchange pools can help alleviate shortages from operational changes (reduced imported water) in Los Angeles, but providing more parties with access to storage improves their effectiveness. Exchange pools could potentially provide 6–12% of total supplies and reduce shortages as much as 86%. Considerations for organizing exchange pools are discussed to explore policy implications for managing common pool resources. The analytical method for embedding undirected network flows within a larger directed-network model has wide applicability for water resource systems analysis applications, including modeling water markets and interbasin transfers. * U.C. Davis hosts a discussion of the content by the authors at California Water Blog. In California, lack of access to clean, safe, and affordable water is a threat to public health and well-being, and violates the state’s newly codified Human Right to Water (HRTW). In low-income communities located outside city boundaries (otherwise known as disadvantaged unincorporated communities or DUCs), drinking water is often unsafe to drink. In many such localities, drinking water is contaminated by industrial by-products (usually associated with agriculture, oil and gas production, transportation, and manufacturing) and compromised by inadequate wastewater treatment and disposal systems, as well as naturally occurring toxic substances like arsenic and uranium. Many DUC residents in the San Joaquin Valley pay a triple penalty to obtain safe water: they bear the health costs of unsafe drinking water; they purchase that unsafe water at high costs; and they must also purchase “substitute” water—typically expensive bottled water—for drinking and cooking purposes. Lack of access to clean, safe and affordable drinking water has a racial and ethnic component: the vast majority of the valley’s DUC residents are people of color who also face cumulative impacts from environmental contamination brought on by proximity to air pollution, pesticides, toxic facilities and waste disposal. Without city governments to directly represent their interests and provide essential services, residents of these DUCs have been systematically deprived of access to important means of democratic governance (Anderson 2008). California’s San Joaquin Valley is the source of much of the state and the nation’s agricultural wealth. Yet it is also a region where poverty persists amidst prosperity (Taylor and Mar n 1998). Many of the region’s DUC residents hold low-wage and dangerous jobs, and confront severe and cumulative environmental contamination of their air, water, and land (London, Huang, Zagofsky 2011). The well-being of the nearly 350,000 residents living in 450 DUCs throughout San Joaquin Valley is therefore an important environmental health, and social justice issue that demands urgent attention by policy makers, public agencies and advocates. Over the past two decades, community leaders, advocates, and policymakers have pursued a range of strategies to address unsafe drinking water in the valley’s DUCs and elsewhere in California. For example, in 2004, resident advocates won a case against the City of Modesto in 2003 for its systematic exclusion from city services of communities of color living in nearby DUCs (Molina 2014). In 2011, Senate Bill (SB) 244 required cities and counties to address the infrastructure needs of California DUCs in land use and municipal service plans, and in annexation decisions. In 2012, an HRTW policy was passed in response to massive community mobilization. Known as Assembly Bill (AB) 685, and signed by Governor Jerry Brown, it codified that every human being has a right to safe, clean, affordable, and accessible water to meet basic human needs, and required state agencies to consider this right when establishing policies and regulations. A 2013 report by the Community Equity Initiative (led by PolicyLink, California Rural Legal Assistance Inc., and California Rural Legal Assistance Foundation) developed a sophisticated analysis of the conditions of DUCs in the San Joaquin Valley. California Unincorporated: Mapping Disadvantaged Communities in the San Joaquin Valley (Flegal et al. 2013) put DUCs on the map by using a new methodology to identify these communities, and to highlight the need for new policies and funding mechanisms to address the significant challenges they face. 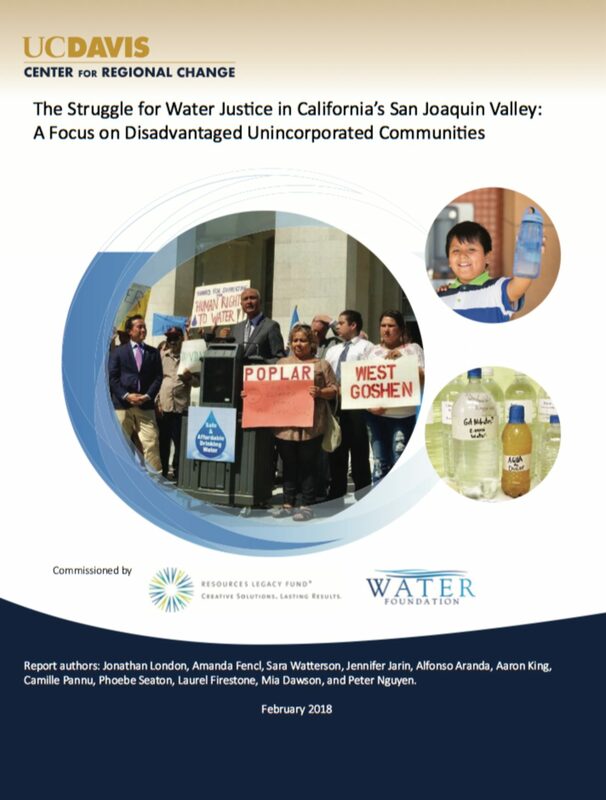 This report, and the dedicated work of water justice advocates, have greatly increased public awareness of water inequality in DUCs. This has helped direct new public funding to improve water infrastructure, and encouraged collaborative solutions among interest groups that historically have been in conflict with each other. However, all parties agree that much more needs to be done to understand the complex issues facing DUCs, and to provide their residents with safe and affordable drinking water. Our report analyzes this situation in detail, and offers several recommendations to inform policy and advocacy on how to improve water access to these communities. To do so, we have used maps of DUCs, CWSs, and State Small Water Systems (SSWSs), as well as water quality reports, demographic data, and expert interviews. Together, these sources have helped us highlight gaps in the provision of safe and a ordable drinking water. Our main conclusion is that California’s legislature, regulatory agencies, and water suppliers need to undertake more concerted and well-resourced efforts to ensure that the HRTW is ensured for all of the San Joaquin Valley’s residents.